Nowadays, there are many inventions of technology, websites and mobile applications that are able to solve real-life problems people were once facing. The scope for this development of mobile application is focusing on medical field in which the purpose is to help people looking for medicine in the nearest pharmacy from their current location. The process of finding pharmacy is not as easy as finding any other shops, especially to locate the pharmacy that is selling the exact medical product that users are looking for. The consequences will be a time consuming and waste of money if they had to drive all away to the wrong pharmacy. 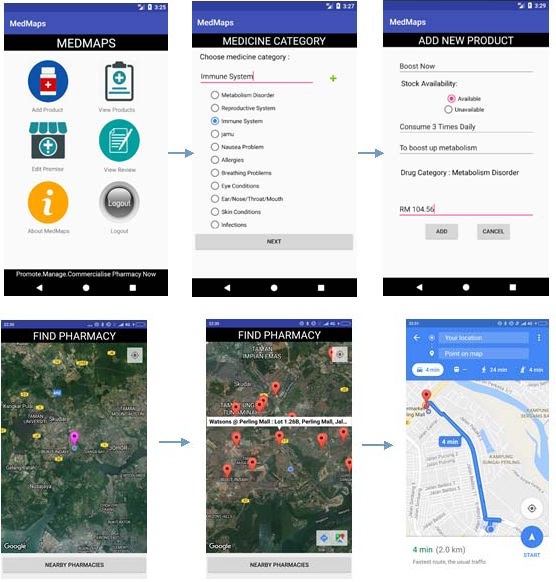 That is how the idea of this MedMaps: Mobile Application for Finding, Managing and Commercialize Pharmacy is generated from. This application also provides Pharmacy a platform to commercialize their store and promoting their products. As for public users, they can also manage their pill consumption intake by setting an alarm that will always remind them when to consume the tablets. The development of this application has going through all required phases based on the Rational Unified Process (RUP) software methodology. The analysis had been done and requirements are being documented properly. To ensure the efficiency of the end product, the literature review on existing system and technology are also important. In addition, the decision on the chosen software architecture plays an important role in organizing requirements, maintaining the quality and help supporting this application development. Other than software architecture and the results from requirements elicitation, low-fidelity prototype produced also helps in supporting the construction of this mobile application. 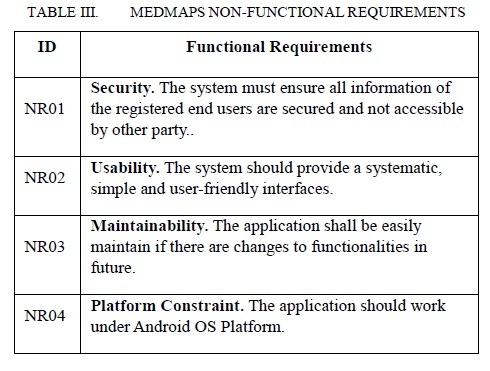 Keywords: - MedMaps Mobile Application; RUP; Finding and Commercialize Pharmacy; Requirements & Software Architecture. The main objective of this project is to develop mobile application with location-based technology. 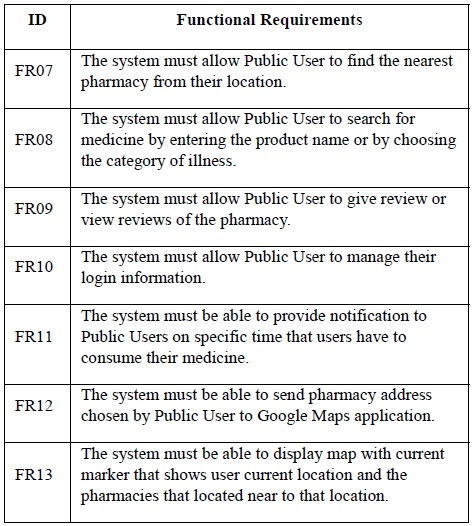 The tag line of this application for public users is “Find.Plan.Search Medicine Now” in which it has three main purpose: (1) to find the nearest pharmacy, (2) to plan and schedule users pill consumption intake, (3) to search for pharmacy that sells the medical product that users are looking for. 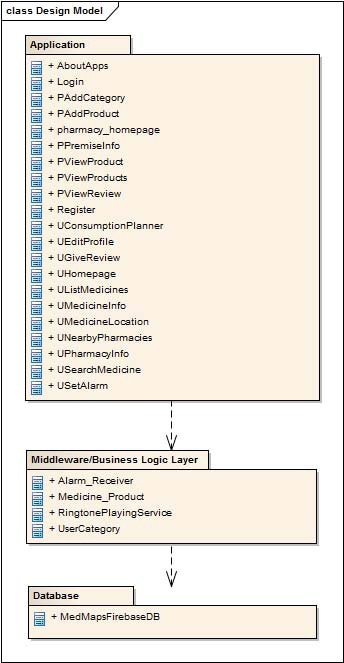 In addition to that, users can view the information of the selling product including the description and Meanwhile the tag line of this application used for Pharmacy is “Promote.Manage.Commercialize Pharmacy Now” in which this MedMaps apps allowing them to promote and advertise their product. They can also manage information about specific medical drugs and inform the users the availability of the item. In addition, this application give a platform for them to commercialize their Pharmacy. that can be used based on the requirements and complexity of the project is the Rational Unified Process (RUP) model. This RUP model is known as an iterative and incremental software model. Iterative development approach in Software Engineering field means the whole life-cycle consists of several iterations which will passes in each phases in specific order. This model provides systematic ways to develop a successful software or in this case a mobile application. Thus, it will help to prevent resources from being wasted and also reduces unexpected development cost. The improvement should have already solved most of the problems and constraints from previous model, so this RUP should be more stable for this project which consists of many features and integration with the location-based technology. 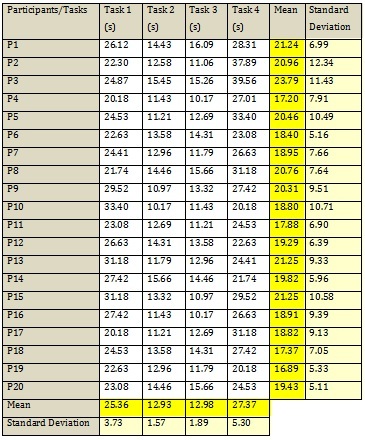 Gantt Chart has been created to schedule the development based on this RUP model. Unified Modelling Language (UML) is chosen for modeling the application. The design will give the overview of the system and provide supports to the construction phase of the application. The Enterprise Architect tools has assist the process of designing the application. Based on the questionnaire distributed results, percentage of Android users shows 83.9% compared to IOS users that only shows 16.1%. From this survey, this mobile application has been decided to be developed with Android platform. 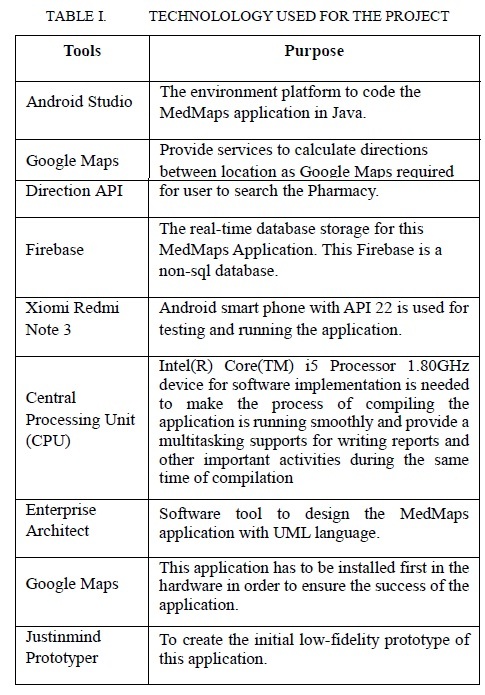 Below is the list of software and hardware tools used to ensure the success of this MedMaps Apps. The requirement analysis and design modeling is the crucial phases as these are needed to ensure the quality of the end product is met. 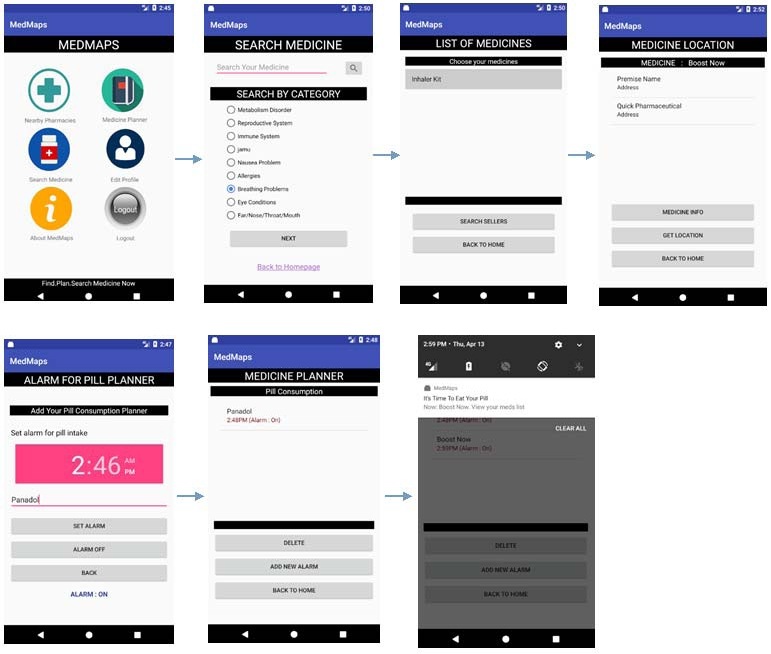 This application consists of two main end users: (1) public users, general users that are using the application for personal purpose, (2) pharmacy, which using application to advertise and commercialize the store. This architecture is chosen because each layer provide services to the outside it and acts as client to layer inside. It’s easy to modify a layer as the need arises without affecting other layer. In addition, it also ensure the security and maintainability of the application. The application is built in Java programming language and Android Studio IDE is chosen as a development platform for this project. With Android Studio, a native application can be easily developed. Meanwhile Firebase is chosen for creating a real-time database storage. Unlike MySQL, Firebase is non-sql database. It stores data in tree structure pattern. Below are the examples of user interfaces designed for this mobile application. There are designed to incorporate with high usability to ease user during any transaction occur in the application. For this project, two type of testing had been carried out to test all functionality. This is to ensure the application to meet all functional and quality requirements needed. Black-box testing is chosen to test all functional modules and the results for overall modules are passed. For user acceptance testing, the usability test is carried out by selecting 20 users to test the application themselves. 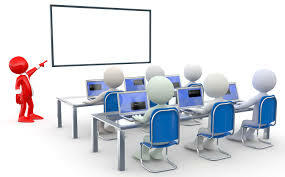 This is to know how fast they are able to learn and understand the application. Time taken by them to finish each task is recorded. 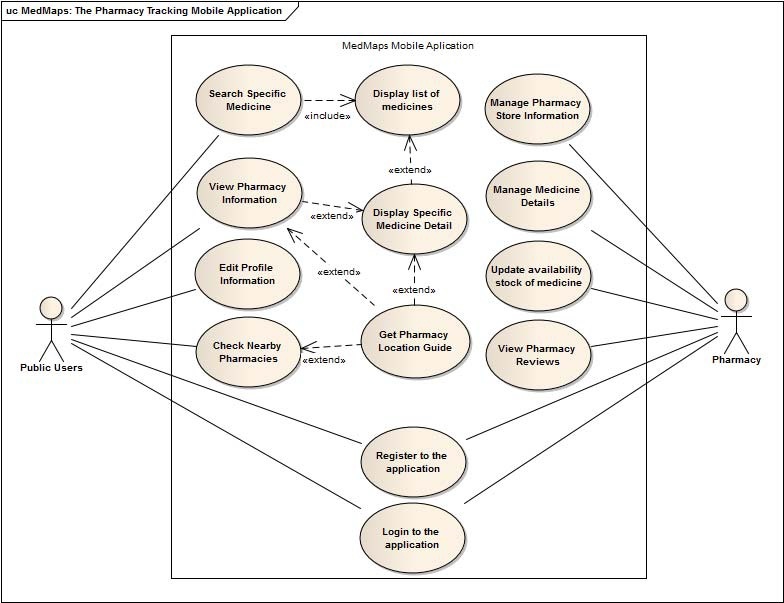 (5) to develop a web based application for the Pharmacy. Pharmaceutical Industry. (2016, March 31). Retrieved from Wikipedia: https://en.wikipedia.org/wiki/Pharmaceutical_industryJ. PSM. (2014, October 24). Retrieved from Bilangan Farmasi di Malaysia: http://partisosialis.org/node/3060. Hologram Meditag Baru. (2013, November 18). Retrieved from Bahagian Perkhidmatan Farmasi Kementerian Kesihatan Malaysia: http://www.pharmacy.gov.my/v2/ms/entri/hologram-meditag-baru.html.